Notice: Customers are responsible for their own data. We take no responsibility for data loss. When possible, we attempt to assist customers who have failed to make proper backups, but can make no promises concerning recovery of data. In other words - you should routinely backup your data in case you have equipment problems. Please see terms of service for more details. PAYMENT TERMS.Tech By Paco accepts all major credit cards and cash. Checks or debit cards are not accepted as a form of payment. STORAGE.Customer agrees to pick-up computer and pay for services rendered within thirty (30) days of service completion. If computer is not picked up within thirty (30) days a storage fee of $1 per day will be charged in addition to the original fee. If computer is not picked up within ninety (90) days it will be considered abandoned and device will be sold to recover damages and non-payment. GUARANTEE.You will be refunded if Tech By Paco is unable to resolve your issue. In some instances, hardware may be required in order to resolve your issue. If the customer chooses not to order the needed hardware or to have us complete service to resolve the issue, a refund will be issued less the bench fee upon pick up ($30 to $65). All services include a thirty (30) day limited warranty from date of original pickup; further description of the limited warranty available on request. LIABILITY.Tech By Paco provides our services in an effort to fix, upgrade, or otherwise repair the computer systems for which you request such services. We will not intentionally harm your system. It is our goal to fix your computer. In the case of accidental damage or data loss to your system, further damage or data loss caused by already existing problems in your system such as viruses, misconfigured software, or hardware problems/failures, you agree to hold us, Tech By Paco, and any persons associated with or involved in the work being done for you, non-liable for any damages resulting from such problems. Tech By Paco is not liable for any and all irreparable damage. Unit’s manufacturer warranty may be voided with service at anytime. SERVICE AND SUPPORT.72-hour guarantee on all repairs: If you believe that Tech By Paco was unable to solve your problem or do the work that we agreed to do, you may contact Tech By Paco for a refund of any fees that you have already paid for such deficient technical support services. We will refund fees provided Tech By Paco receives your request within seventy-two (72) hours after the completion of the deficient technical services. 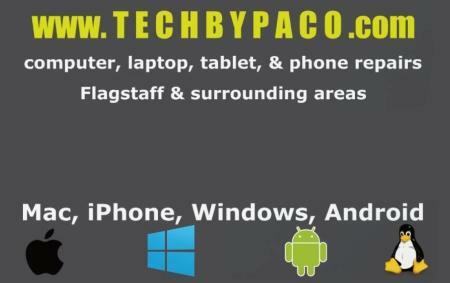 Tech By Paco also provides up to 2-hours of no-charge phone, Live-chat, and remote support after each repair to be used within 7 days after the initial engagement. Tech By Paco reserves the right to request additional information from you, or reject the request for a refund, if Tech By Paco reasonably believes that a refund request is abusive. Tech By Paco may create a digital image of your system before any other work is done, but this does not waive your responsibility of making regular backups. This image will be used in case the customer wants the system to be restored to the pre service condition. The digital image may be archived for one month, and then deleted. INDEMNIFICATION.Client agrees to indemnify and hold Tech By Paco harmless from all claims, losses, expenses, and/or fees including attorney fees, costs, and judgments that may be asserted against Tech By Paco. ENTIRE AGREEMENT.This Agreement contains the entire agreement of the parties, and there are no other promises or conditions in any other agreement whether oral or written concerning the subject matter of this Agreement. This Agreement supersedes any prior written or oral agreements between the parties. GOVERNING LAW.This Agreement shall be construed in accordance with the laws of the State of Arizona. Confidentiality Agreement.Any private information stored on your computer or viewed by a support specialist(s) at Tech By Paco during service will be held confidential unless required by law. Any private or personal information provided to Tech By Paco will be kept confidential. Service Appointments and Product Purchases.If you make a service appointment, you warrant that the information you provide to Tech By Paco is true and accurate and that you have the right to make transactions using the information provided. Tech By Paco is not liable for any misrepresentation of information by a customer.